4. 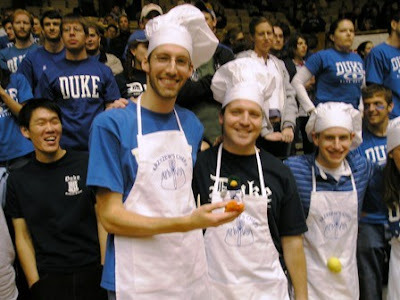 As much as I hate to admit it, a live Duke game is more fun to attend than a live Carolina game. The crowd, the bouncing, the crazy towel guy, the closeness, the heat, it all adds up to a more intense experience. 5. Camping for tickets is fine, sounding a horn/alarm at all hours of the night and morning is not fine. Nobody has gone, it just ticks people off, some people have school and work and need sleep! I guess misery loves company. 6. But lastly and most importantly I still am and always will be a Tarheel! when the fans heckle and are mean to the other team. They do this pretty much right in their face, they're practically touching the players when they run by or throw the ball in after a foul. My view being blocked by this fro, so annoying. 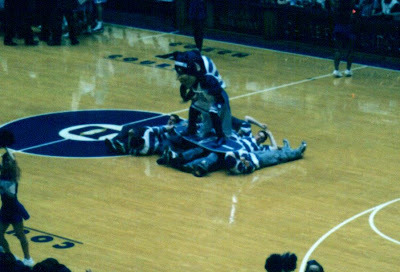 Blue Devil surfing across the band students, they go pretty much the length of the floor, it's fun to watch them get up after they've been "surfed" over and throw their bodies on the floor at the end of the line to do it all over again..over and over again. 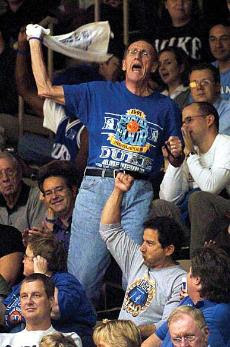 The most recognizable fan: the crazy towel guy-he's had season tickets for the past 27 years, he's there every game and all the students start chanting "crazy towel guy", when they get loud enough he stands and swings his towel. *It was a fun season, but I'm glad Roy's boys were able to pull out a W over the devils both games this season! How bout them heels? !